Liberated Kramatorsk residents celebrate Easter during an open air event. Kramatorsk is still in the conflict zone in Ukraine and just to remind the city was heavily shelled with Russian MRLS BM9K58 Tornado by Russian mercenaries just two month ago during another day (on Feb 10 2015). Young and old people now are tired from warfare during a year of Russian military invasion into Ukraine and are glad to celebrate the spring coming. Full English description and sound bites translation will be provided after request. 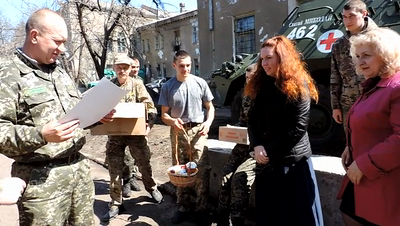 Ukrainian volunteers bring homemade made Easter presents to Ukrainian border guards in Kramatorsk. 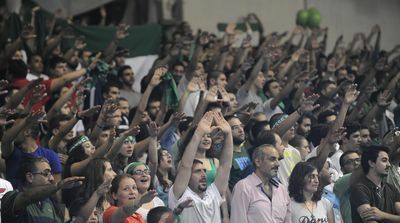 Sagesse fans in Fouad Shehab stadium raising their arms while chanting the national Lebanese anthem. 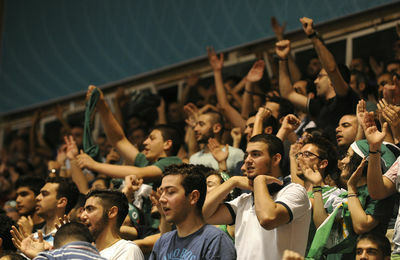 Sagesse fans cheering for their team in Fouad Shehab stadium. 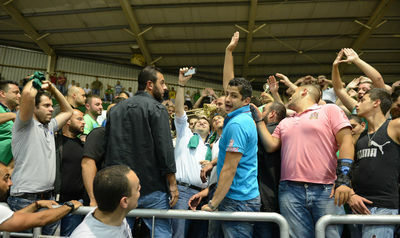 Parliament member Nadim Gemayel is taking a selfie with a Sagesse fan among the crowds. 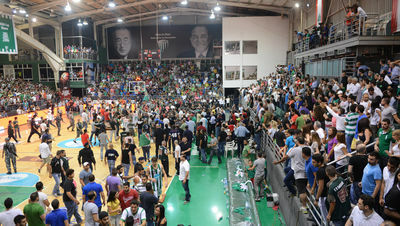 A chaotic scene at the end of the match because of the fight that occurred between Sagesse and Sporting. 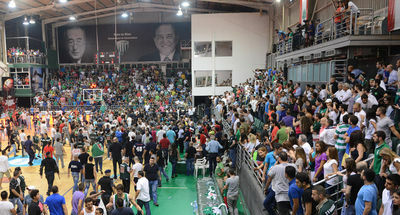 A chaotic scene at the end of the match because of the fight that occurred between Sagesse and Sporting..
Parliament member Nadim Gemayel is waving the crowds and the Sagesse team. 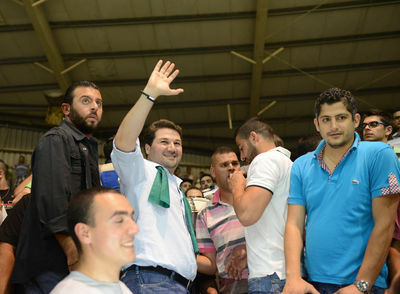 Nadim Gemayel, parliament member is joining the fans of Sagesse with an enthusiastic high five. 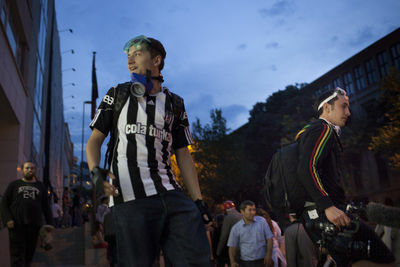 Soccer fans gathered outside Taksim Square on June 4, 2013, prepared to battle police after having built barricades. 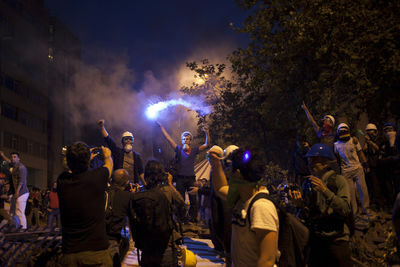 Fans of rival teams, Besiktas, Fenerbache and Galata Saray joined forces chanting slogans against the Prime Minister Erdogan and encouraging police to "be real men" and lay down their weapons. Girls protesting outside Besiktas Football stadium gathered in Istanbul, an area that has been the site of the most severe clashes between police and protesters in recent days. Thousands gathered in advance of Monday's protests, many of them high school students and young people. 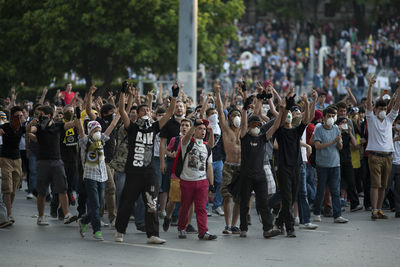 Demonstrations head towards Besiktas from Taksim Square on the 6th straight day of protests across the city. 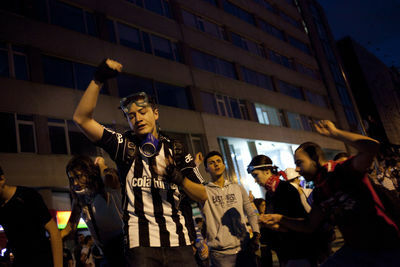 Outside Besiktas soccer stadium protesters commandeer a security building in order to stop traffic. 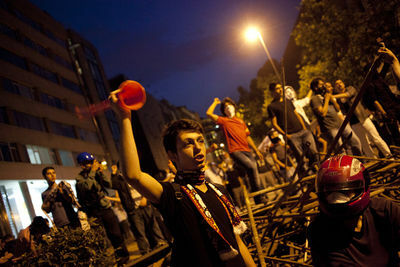 Protesters carry stones during clashes with police outside Besiktas soccer stadium in Istanbul. 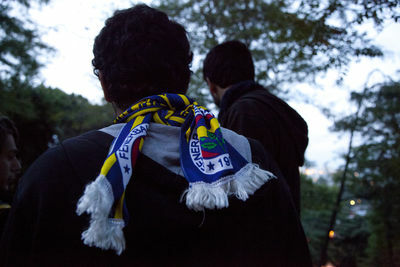 Rival Turkish football fans have battled each other for years. But for the first time in history, fans from Istanbul's most powerful teams, Galatasaray, Besiktas and Fenerbahce have found a common enemy; Prime Minister Recep Tayyip Erdogan and his AK Party. For nearly a week the three major fan's firms, Carsi, UltrAslan and Genc FB have put their differences aside. Galatasary football fan Baris Demerli remarked "One month ago, we were killing each, now we got together and have formed 'Istanbul United'." 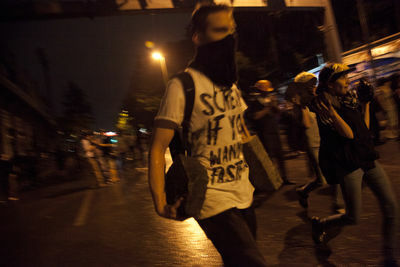 Nightly they don ski goggles and face masks and wrap themselves in football scarves against the effects of tear gas to do battle with the police. They see themselves as an army of resistance, the protectors of the people. 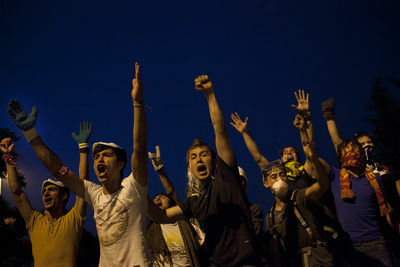 And the people they are protecting are the thousands of peaceful protesters camped out in Istanbul's Gezi Park, demanding a change in the Turkish leadership's policies on urban development. 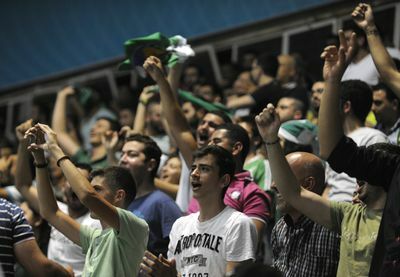 According to Hasan Esin, a die-hard, card-carrying Galatasaray fan and member of the UltrAslan fan club, the call to fight went out last Friday. "Besiktas is bad, we need reinforcements," was the message that came through Twitter and Facebook. 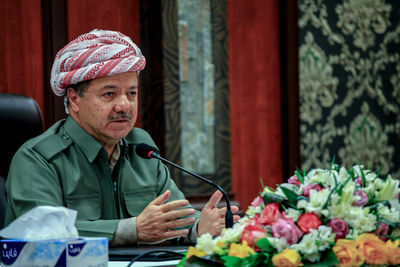 "We all went down to help", says Esin, who is a towering, powerful man with a gentle smile. 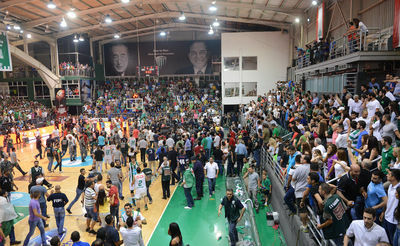 Thousands came to fight with police every night since. 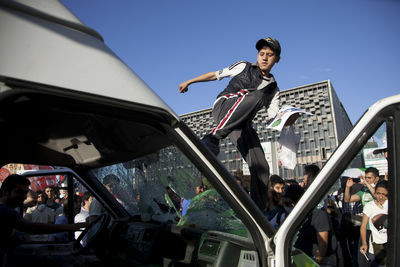 Many have been injured, and officially three people have died, one police officer and two protesters. Erin says it's devolved into a guerrilla war. The football fans whose only weapons are paving stones have had to fight the "excessive force" of the police with "excessive cleverness." They have built barricades from burned out vehicles, police gates, lamp posts, sign posts, paving stones, fencing and all sorts of metal objects they've harvested from the urban landscape. They use the barricades to block the police. 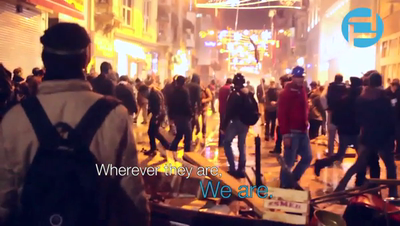 Taksim Square is surrounded on all sides. 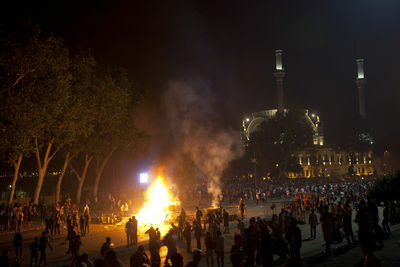 Police can not come to Gezi Park without first bulldozing the barricades, which means facing off against the football fans. 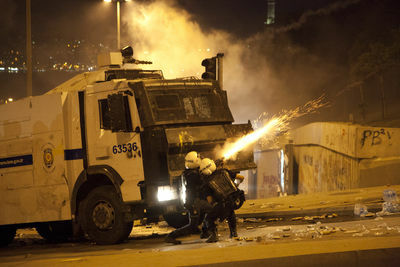 Police have fired thousands of rounds of tear gas. They've used water cannons and rubber bullets. The football fans have used a series of tactics. They throw stones, they try to toss back teargas canisters. 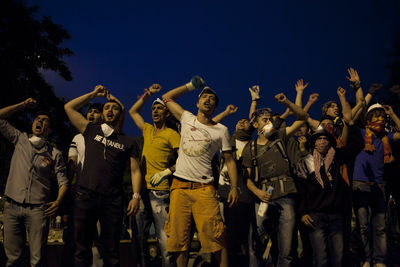 They yell, they chant vulgar slogans. 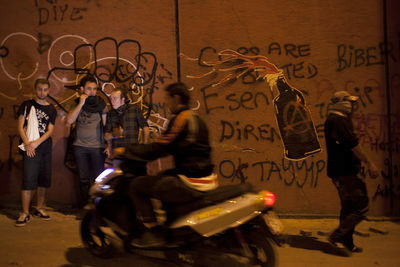 One day they decided to pour gallons of olive oil on the steep incline up to Taksim Square. The police tank skidded each time it attempted to climb. 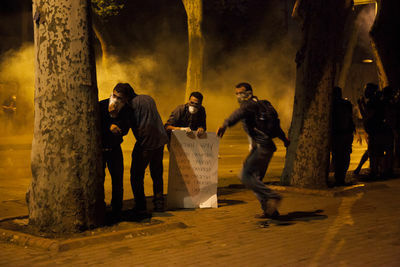 The violence began last week May 30, 2013 when police forces raided Gezi Park, surrounding sleeping protesters, tear gassing them and lighting tents on fire. 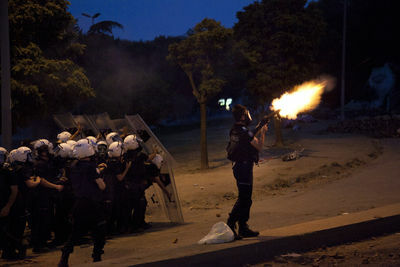 The excessive use of force ignited tens of thousands of people to rise up against the government's heavy-handed tactics in support of Gezi Park. Nowadays the park is full of protesters camping out, playing music, dancing, chanting, sharing food, books, medicine and even offering "free hugs". Erdogan "crazy projects": a third Bosphorus Bridge, a third airport for the city and a new shipping canal have infuriated environmentalists, urban planners and ordinary citizens of the already sprawling megalopolis. The destruction of a small park in the center of the city in favor of yet-another shopping mall—the city already boasts more than one hundred—was the last straw. 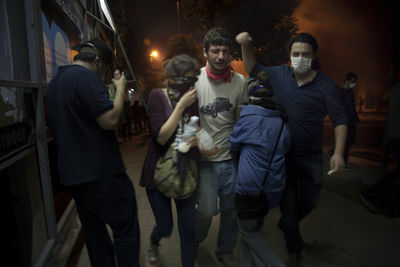 While free hugs and free love dominant the mood in Gezi Park, the football hooligans, hyped up on adrenaline, suffer casualties (some say 50 people have died facing off against the police). 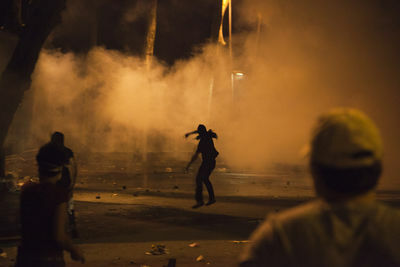 Volunteer medics rush people to nearby makeshift clinics to be treated for the effects of tear gas, oftentimes breathing problems and impact wounds from the teargas canisters. 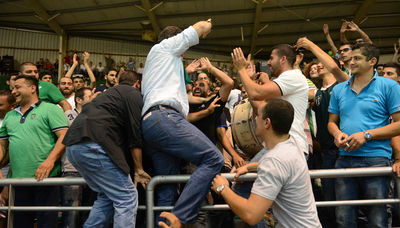 Brave or bold, the football fans continue. 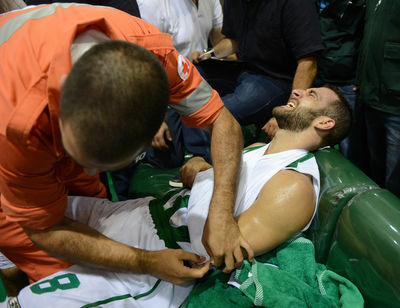 A video circulating online makes light of the situation. In it, football fans dial the police emergency number. "Please, police, send more gas," demands the addicted football fan. "Okay, we are coming," promises the police officer. 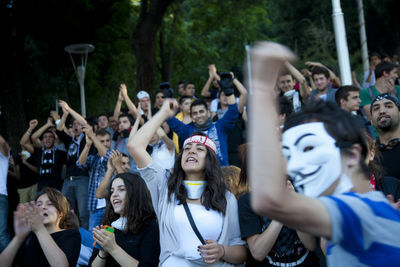 In Besiktas quarter, many Turks gathered to confront the police during the Occupy Gezi Park protest which has taken over many Istanbul neighborhoods. 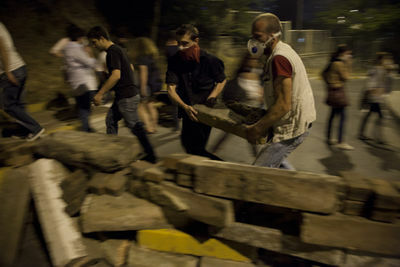 People build barricades out of salvaged paving stones on the 6th straight day of protests across the city. 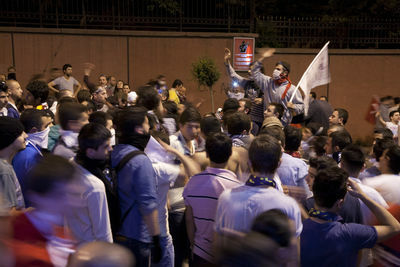 Outside Besiktas soccer stadium protesters stop traffic. 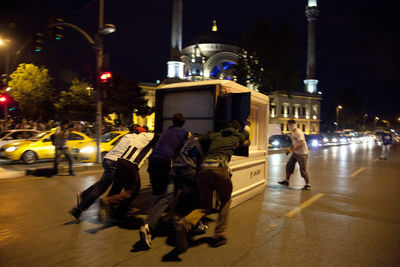 Protesters run from police during clashes outside Besiktas soccer stadium in Istanbul. 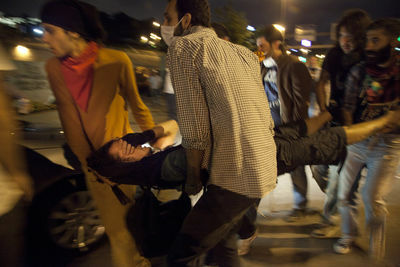 Protesters carry an injured man to a taxi to be taken to hospital outside Besiktas soccer stadium in Istanbul. 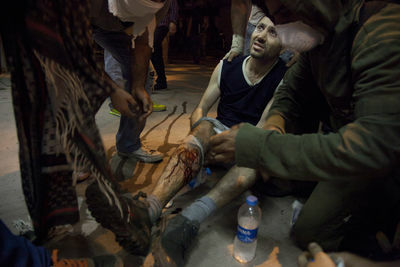 A man with a broken leg is treated by volunteer doctors outside Besiktas soccer stadium in Istanbul.